If you’ve never heard about Scanner then you’ve probably been spending the last 20 years on the un-illuminated side of a far away planet listening to … well … basically nothing. Calling him prolific and multi-talented is almost an understatement. Since the beginning of his career he’s released 60 full-length albums and 23 singles, remixed 71 tracks, collaborated with many important artists, composed uncountable scores for radio, film, television and theatre and worked on numerous installations (source: discogs). Some time ago he posted the above video on Facebook showing a patch for a new track he was working on. I’ve been a fan of his work for quite some time, and especially appreciate the reductionist approach (to use his own words) of his compositions. Having wanted to interview him for some time, I jumped right in and asked him in a comment if he’d be willing to answer a few questions, which he immediately agreed to. Some time later we met on Skype (on an actual call) and started to chat about his career, his love for modulars and about some projects he’d been working on. The first thing that strikes you when you talk to Robin Rimbaud, apart from him being a very kind and humble person, is the beautiful timbre of his voice and the calm tone in which he speaks. A perfect reflection of his music, one could say. What was initially supposed to become a short thing for the Chosen Waves series, turned into a more elaborate “artist portrait” piece, spanning across his first encounter with the modular to one of his latest works: a theatrical score for modular synth and orchestra. 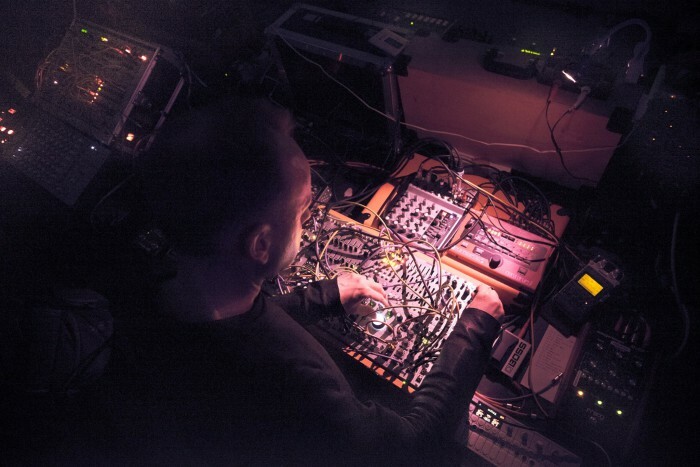 In the last years, Scanner caught the attention of the community due to his many modular tracks, demos and videos. To the casual observer this might appear as being the product of the recent “Eurorack boom”, but his interest in this type of instrument actually dates back to 1993, when he created his second studio album Scanner 2 using an EMS Synthi. He explains the process used to create the album like this: “I was essentially using environmental recordings, the sound around me – this indiscriminate signals that I picked up through the airwaves – and put them trough the Synthi. I was using the synthesizer as a kind of processor, as a very sophisticated fx unit”. Interestingly the person he borrowed the Synthi from, tried to sell it to him for £150, but Rimbaud refused due to lack of space, something he still kicks himself for. His first contact with the Eurorack world came years later: “I was working in Richmond with a friend of mine, Stephen Vitiello, an American sound artist and composer. He had a Doepfer system and maybe even a Cwejman” he remembers, “I began playing with the system, but I’ve always been a bit of a reductionist, ironically, I’ve always been somebody who tries to use very sophisticated technology but tries to produce something that doesn’t get wrapped up inside the technology. Therefore it still retains the original premise of it, which is to tell the story with sound”. 2 and a half years later, in 2014, Rimbaud and Vitiello went to MIT (Massachusetts Institute of Technology) for a visiting-artist residency and Vitiello brought his modular synth along. They spent 6 months working with the system, trying out things and crafting sounds. After this experience Rimbaud decided to build his own system and started to buy some modules. “It starts somewhere and doesn’t stop, ever since, the addiction doesn’t stop” he tells me during the interview, I’m sure we can all relate to this somehow. Rimbaud’s love for the modular has different reasons, many of which are quite irrational: “Like many things in life I do not fully understand it. For me in some ways that’s a joy, because essentially you can input and output in any way you wish. Sometimes it works and sometimes it doesn’t. To me there’s a real joy in the unexpected”. But there’s also the joy of moving away from the omni-present computer screens, though not just for the sake of doing something different, it’s more about gaining a different perspective. The computer distracts him due to all the visual devices, which the machine employs to represent sound. “If I’m working with a choreographer, as a good example, he or she will sit with me, and then watch the movements of the blocks of sound”, this is something he doesn’t find very rewarding, since “you stop listening and you start watching […] so the modular is exciting and stimulating because it’s only about the ears”. The only thing he doesn’t love about modulars is the way the modules are installed into the cases, which he calls “extremely frustrating” and a “real burden”, since it makes it pretty hard to shift things around (again, I think that’s another thing we can all petty much relate to). When I ask him if he regards the modular more as an instrument or as a sound-design machine, he replies that he finds definitions “almost impossible anyway”. “It’s a machine, a tool that offers sonic possibilities” he carries on “Those possibilities for myself can lead to very musical means, and they can lead to very sound-design means. I use it for treatment of sounds, I use it also as an FX unit, so it’s a very versatile system and I think I still call it a system in a way. It’s not one and it’s not the other, and that’s to its advantage, that one cannot say that it’s that one thing”. Above: Scanner’s track for Tip Top Audio Records’ compilation Various Artists 002. 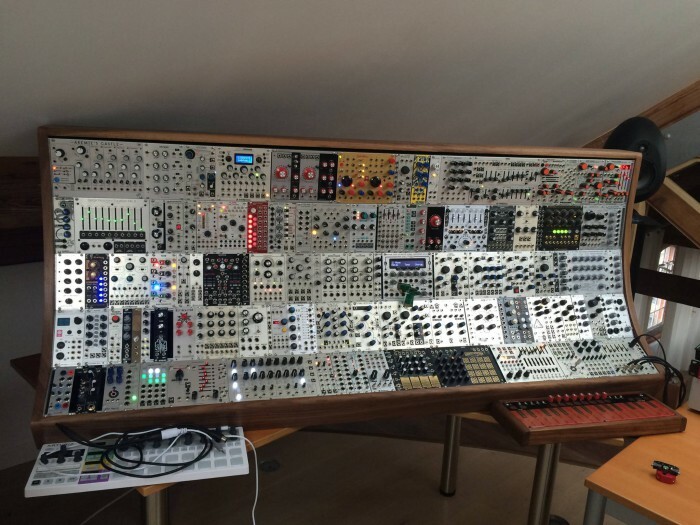 In his studio, Rimbaud has 7 cases full of modules, he explains: “I have a Verbos system in one case, I have a Mutable Instruments system in another case and I’m drawn to them for different reasons”. Despite owning a big modular, he likes to keep things as simple as possible. He seem to be interested less in the technology than in what you can do with it, or as he points out quite fittingly: “What is important … for lack of a better word … the story needs to be told, the story you are telling with the sounds needs to come true, it doesn’t need to be lost in translation”. This search for the essential and the focus on the “story” is probably the central element of all of his work. Later on he tells me how he read about the band Muse going back to their roots with their most recent album: “they said they had enough of these grandiose, elaborate productions, so it’s essentially just drums, bass, guitar and vocals and they said like: ‘here’s a screen grab of one of our tracks’, it was 96 tracks! 96 channels on one track!” and he thought “back to the basics, I see!”. Scanner is certainly not interested in adding, more in removing. “I try to remove as much as possible” he compares it to a house of cards: “I try to remove as many cards as possible but still keep the house standing and see if the story can still be told, if the narrative is strong enough, it doesn’t need anything more”. He links this approach back to his early beginnings: “I began using a tape recorder” he tells me “which gave me a way of working with sound in a linear fashion, by which I mean: I could record you playing the guitar or the piano, and I could pause the tape and record the sound of traffic passing outside, then I could pause and record me singing and so on”. His first tape recorder didn’t have multiple channels, so you could only arrange sounds in sequence. Later, he got a two-track reel-to-reel recorder, which opened up a whole new set of possibilities: “Suddenly I could tell a story, I could make one sound talk to another sound”. The next level was a Fostex 4-track tape machine, which he also used for his first albums, finally he could bounce tracks, combining them, thus freeing up channels to record even more material. Still these machines would pose limitations on what you could do and how fast you could do it. In contrast with them, a modern computer will offer almost infinite channels, bringing along the risk of getting “completely lost in that”. Somehow this way of working has defined the Scanner sound in such a deep way, that even if he could make extremely elaborate patches with hundreds of sounds going on, he just doesn’t seem to be interested in it. “I clear up the cables after every time I record it” he tells me in the interview “I don’t keep them at all”. He doesn’t even take notes, and just keeps the recordings of what he produced with the patch. The reason for this is very simple: “I’m somebody who retains the idea of this being about the moment”. Sometimes this approach isn’t fully understood by other modular synth enthusiasts. Somebody recently commented one of his videos saying: “I enjoyed this but, you’re not doing much with such a big system”. Rimbaud, doesn’t understand this: “What do you want? Do you want a really big sound? You want lots and lots of layers all rolling around with one another?”. He doesn’t have a problem with other people working like this, “Because some people – Richard Devine is a good example – can do this extraordinarily well” he tells me, but then he adds: “That’s just not my voice, that’s not the way I work”. 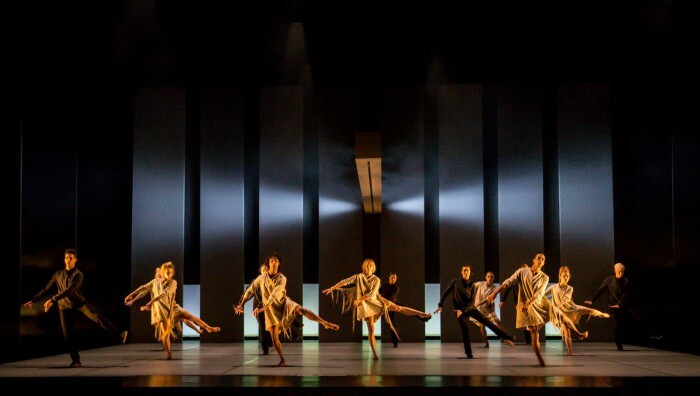 Rambert Dance is Britain’s most important contemporary dance company and Tomorrow is their 25-minute take on Shakespear’s classic Macbeth, or, as the official text says: “inhabits the dark and dangerous world of Macbeth” (source: www.rambert.org.uk). Rimbaud was first contacted by Lucy Guerin, an Australian choreographer, to work on the score for the play: “We were both commissioned to make this piece for Rambert Dance in London … and what she was looking for in our very early conversations were pulses.” The choreographer wanted a series of regular pulses, that would stretch throughout the duration of the piece. Rimbaud could have done this digitally, but instead chose to go a more analogue route: “For this I used the modular system, because I could use clock dividers, I could use filters and I could make this thing feel really organic” he says, then explains the concept in more detail: “It’s a very organic process, the time slips, it gets faster, it gets slower, things move in a very real way, but the modular is going to lock it”. When he chooses to use one thing or the other, it’s usually about it being joyful, as he explains: “I use this word repeatedly, but life and work needs to be about a sense of joy, you need to enjoy this, it must not feel like work always!”. The pulses were just one aspect of the music, there was also an invitation to work with live players, with an orchestra. He tells me in the interview: “I wrote a series of pieces, about 6 pieces, and worked with an arranger called Quinta back in London and a young woman composer, who’s a great violinist, who ended playing violin and also a saw”. The live-played, amplified saw and wine glasses in the score, were chosen to reproduce some of the electronic sounds created by Rimbaud for the composition. Above: one of Rimbaud’s sketches for Tomorrow. These layers were kept separate until almost the very end, the orchestra was just provided with the starting point of what the pulse track was about to become: “I set a whole series of pulses going, I spent a few days making them on the modular and just interlocked them, ran them trough different filters and treated them in different ways; They rehearsed to just the pulses”. Only about a week before the première, once everything had been written, arranged and rehearsed, these two layers came together and they could finally hear both things happening at once: the live players and the electronics. Rimbaud remembers the moment very fondly: “It was really beautiful! This offered them a great freedom in a way”. In the end I ask him if he could imagine scoring a piece for the modular just as he would do for an orchestra or a traditional solo instrument. He finds it an “intriguing challenge” and adds: “it would be possible in some ways to score it, to write down developments, filters, changes, these kind of things, but rather like a lot of very exploratory scores, a lot of the actual responsibility, would then rely very much on the performer themselves”. Which he thinks would be interesting, because the actual idea of reproducing something doesn’t interest him at all. “I mean … from the very start of my professional career” he points out “the last thing I ever wanted to do was to release records and then perform those tunes live. Even when I was at the stage of playing lots of concerts and releasing CDs, I very rarely played the show and played all my tracks off the CDs”. 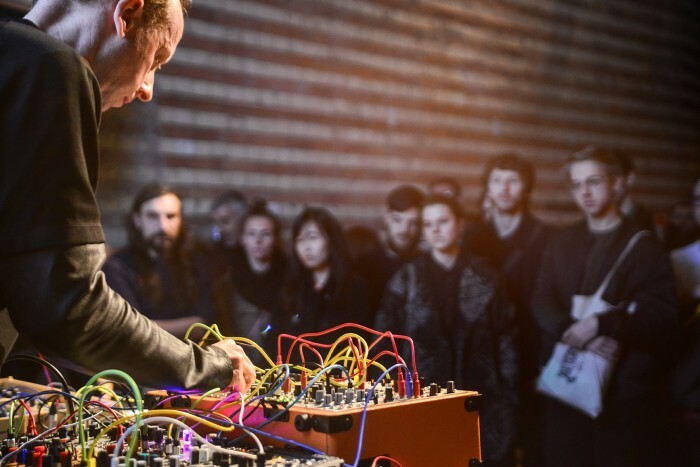 From this perspective the idea of scoring a piece for modular synth would be a great challenge, but also a rewarding one: “it would be interesting because it would allow a performer to bring also their voice, their interpretation, their history, their knowledge to this performance”. Let’s see, maybe I have planted a seed in his mind, and we will indeed see a piece for modular synth scored by him in the near future.